Auto Text Expander for Windows and Mac. 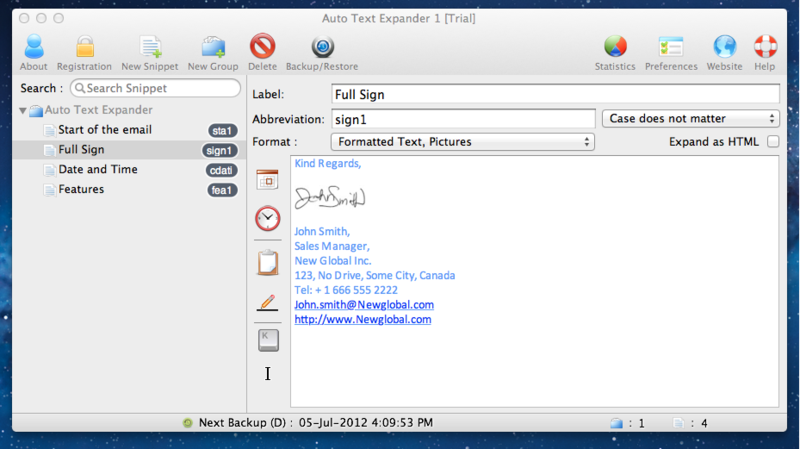 Auto Text Expander is an application to create customized abbreviations for your frequently used Text. 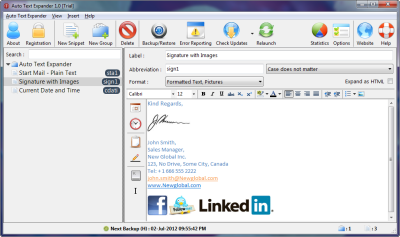 The Application allows you to create snippet which can be plain text or rich text with images to abbreviations. When typing those abbreviations the snippet associated will be triggered and typed to any application you are working on your Windows and Mac. Type faster using abberviation in any application. If you forget the abberviation then keyboard shortcut will suggest it. You can add some predefined macros also as abbreviation, which is useful for filling up forms, Web forms etc. Available for Windows 7, 8, Xp, Vista, 2003, 2008. Why Auto Text Expander ? 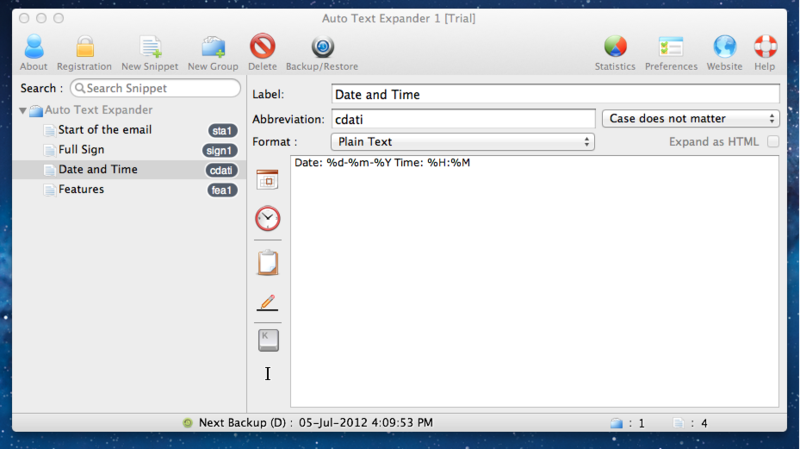 Use Auto Text Expander to save your time and efforts by avoiding typing the most commonly used content again and again. If you click the Statistics button, you're able to see exactly how many keystrokes you've saved, and translate that to how much time you've saved on a WPM basis. You can have a backup of all the groups & snippets and can restore whenever you want. 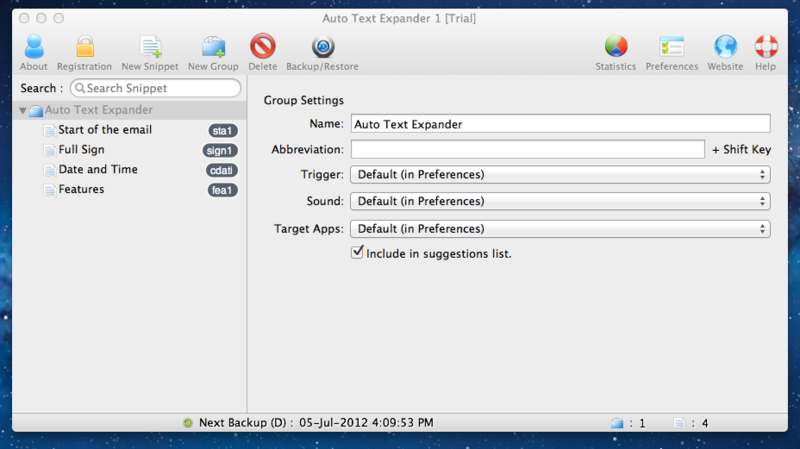 Options are very extensive with Auto Text Expander. 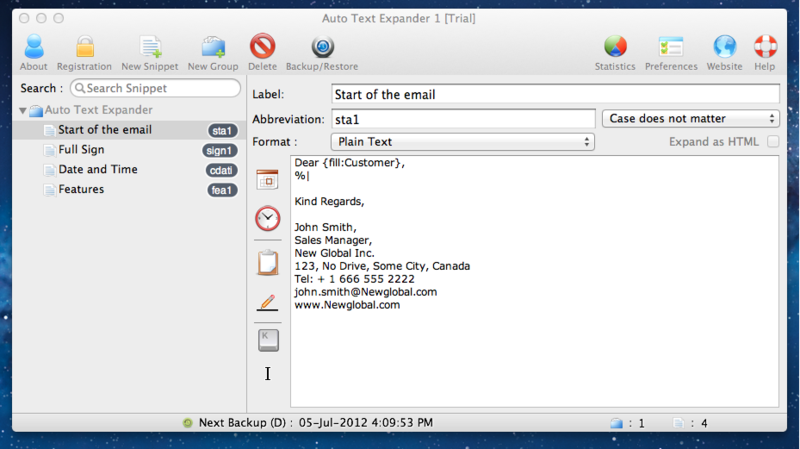 You can set Auto Text Expander to work with only certain applications, which is very useful in certain situations. Pre-defined macros, such as Date, Time etc. Use Fill-in Macro to store the details you need to fill regularly in the forms etc and trigger anytime. You can set the key combinations, termed as Hotkeys. Hotkeys allow you to easily control Auto Text Expander by adding new snippets, opening the application, or enabling/disabling the application. "I am totally enjoying working with Auto Text Expander. It's been an awesome experience and it helps me saving a bunch of time every day. Your program is very easy to use and very handy. 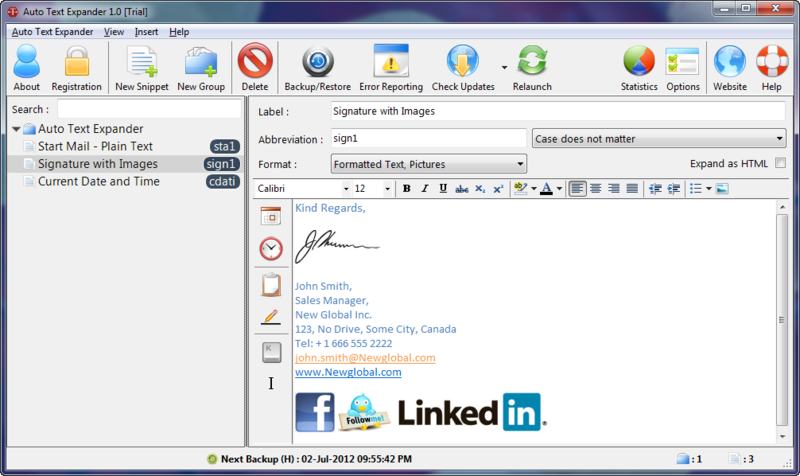 I use it to save several common mails, introductory lines in every mail, foot-notes and signatures. Thankfully, It worked exactly as advertised."